APPLE HAS NOW paid the €14.3 billion in back taxes and interest that was due to Ireland following the landmark EU ruling in 2016. In a statement this afternoon, Finance Minister Paschal Donohoe confirmed that the entirety of the funds have now been collected. 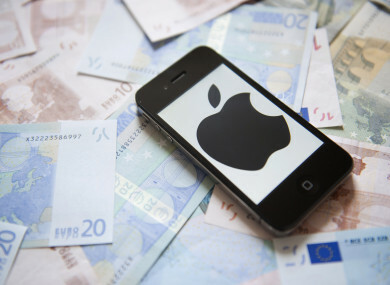 The department said that approximately €13.1 billion in state aid and €1.2 billion in interest was deposited in the escrow account by Apple over the second and third quarters of this year. “The full recovery of the alleged state aid is a significant milestone and is in line with the commitment given earlier in the year that the alleged state aid would be recovered by end Q3 2018,” the department said in a statement. Then last year the National Treasury Management Agency revealed that BNY Mellon had won the tender to operate the multi-billion euro escrow account and in May it was confirmed that the first tranche of the funds were paid. Speaking today now that the entirety of the funds have been paid, Minister Donohoe again reiterated that the government is seeking the have the EU Commission’s decision reversed. “While the government fundamentally disagrees with the Commission’s analysis in the Apple state aid decision and is seeking an annulment of that decision in the European Courts, as committed members of the European Union, we have always confirmed that we would recover the alleged state aid,” Donohoe said. We have demonstrated this with the recovery of the alleged state aid which will be held in the escrow fund pending the outcome of the appeal process before the European Courts. Email “Apple pays over the €14.3bn due to Ireland - but the minister again denies that it's owed”. Feedback on “Apple pays over the €14.3bn due to Ireland - but the minister again denies that it's owed”.